Now, on to more complicated things. Determined not to let my sewing skills be spent solely on patternless burp cloths - as fun as they are to make - I pulled out the mother of all UFOs. But wait... can it be called a UFO if I've never even started it? 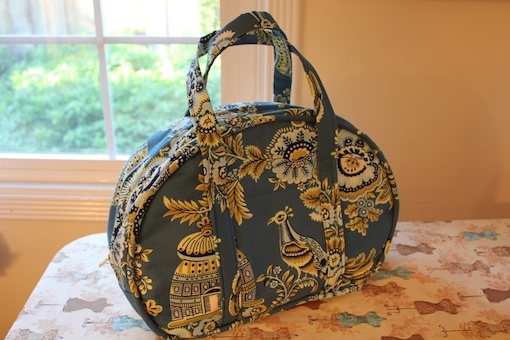 I've had all of the materials to make the Amy Butler Sophia Carry-all for maybe a year and a half now? Maybe even closer to two years? One of the first things I ever made from a pattern was an Amy Butler bag and I always thought I'd make another. I picked up this pattern so long ago and had gradually collected all of the materials for it. However, I lacked the motivation to do it. I was so frustrated by this that at some point I actually put everything on top of my sewing drawer caddy. Thinking that would motivate me to complete it. Yeah, I think it sat on top of that caddy collecting dust for a year. So, on New Year's Eve, I decided that I was going to do something about it. As I began the project I was excited to see that it only had a few pattern pieces. Then I realized I had to cut each piece a zillion times. I need the main fabric, the lining fabric, a fleece lining, AND interfacing. UGH! The prep-work on projects is one of my least favorite things and half way through I almost thought about calling it quits and naming this 'the project that would never be.' But I stuck through it. After a few hours I was actually able to start putting the pattern together and that's when I realized it was actually going to be fun. The bag assembly was really straightforward and pretty neat. The hardest part was lining up the pieces on the base to attach it - between the cording that was already attached and making sure everything was lined up and tucked away as it should be, I probably spent a good hour on that step. But once it was done you were left with a complete bag. On the outside. 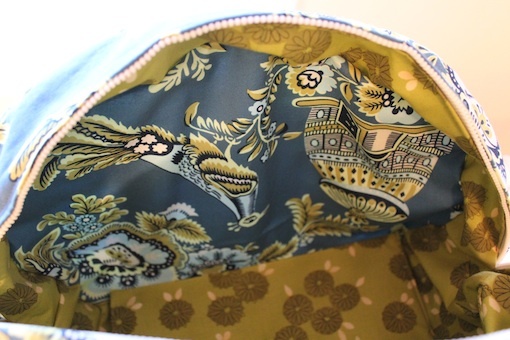 You then had to repeat almost everything for the inside lining. But it wasn't so bad - there was no cording to deal with or handles to get in the way. I only made minor changes to the pattern. 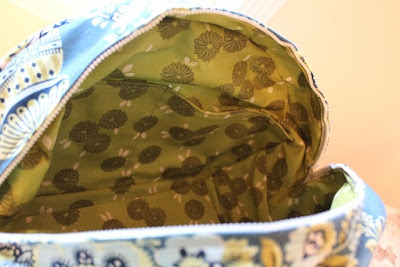 Having made an Amy Butler bag before, I thought the pockets would be way too big. In my last bag, I would constantly lose things inside because the pockets took over half of the inner bag and would meld together. With this bag, I decided to only do a pocket on one side and I stitched the pocket down the middle so it wouldn't just be a bottomless pit. I could actually put a cell phone in there and find it again when I needed it. Oh, and with my pattern cutting frustrations, there was of course a minor error. I forgot that the exterior fabric had a pattern printed in one direction so I ended up cutting a piece out upside-down. Instead of chucking it, I decided to just use it was lining. That way I wasn't wasting any fabric and no one would know unless they peeked in my purse. This left more of the lining fabric as scraps which would be an issue as I'm stash busting, but as we learned, I do enjoy making burp cloths and wash cloths. So I'll be happy to use that scrap fabric for one of those projects instead. Thrifty, eh? Fabric: About 3 yards of fabric. I think they were both Michael Miller? I don't remember the price as I bought them so long ago. Also interfacing and scrap flannel fabric. Oh and a piece of hard quilters plastic for the base of the bag. Time to complete: 6 hours? The bulk of the time was spent cutting out the pieces. First used: Haven't used it yet. 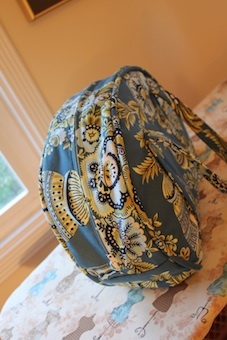 May use it as a diaper bag as it's large enough, or just a regular purse. Total cost: Priceless? Just to be done with it! So ultimately I got rid of a project that I've had for ages. About three yards of fabric used up, Interfacing and notions put to good use. I'm excited to have not only finally completed this project, but to continue on my path of stash-busting. I have some more little projects coming up, and I need to pick up more terry type material to make more burp cloths and possible changing mats. A lovely reader told me that 8 burp cloths would definitely not be enough and I only have the changing mats that have come with my diaper bags. So I'm happy to go through some more of the tons of fabric that I have lying around. Stay tuned! That turned out very nice! Wow! I love it. I've never made a bag. I have enough trouble finding a few minutes to sew clothes. I love that fabric you chose - yellows and blue work so well together - it's such a marvelous bag!